The FASEB Journal reported on a randomized, controlled, crossover trial with 48 healthy individuals, around 18 years of age. The trail was done with oatmeal and a ready-to-eat oat-based breakfast cereal (RTEC) in random order at least a week apart. The results were: The oatmeal suppressed the appetite of the individuals partipating in the controlled trials , and increased fullness, and reduced food intake compared to RTEC. Food intake at lunch was lower after eating oatmeal compared to RTEC. The finding were noted that physicochemical properties of oat fiber are important factors affecting fullness and food intake. The study was funded by PepsiCo. We wanted to share our breakfast with you, and with the information we just shared, you may have guessed it was oatmeal. Whole food is really better for your health. That is how we prepared our Fruity and Nutty Oatmeal with a Tweast. We used Half and Half for extra creaminess, blueberries, a banana, and the tweast is the sweetness by adding Ginger syrup. Heat the half and half in a small sauce pan. Add a cut up banana, then the blueberries, followed by the pecans, and oats. Stir together until well incorporated. The cooked oatmeal will be lose. If you desire you can add more oats. Next add the ginger syrup. 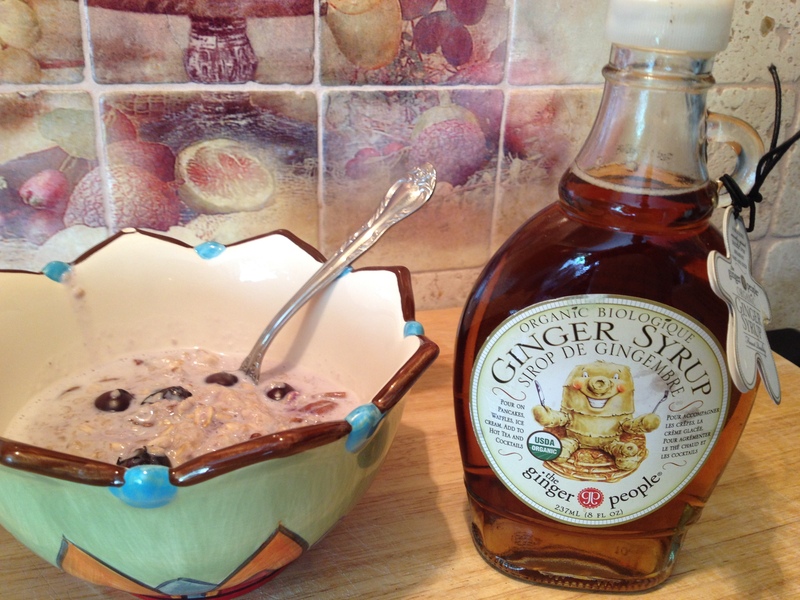 If you can’t get ginger syrup, replace with real maple syrup. Spoon into a bowl and serve. The banana adds potassium, and magnesium to your diet, great for heart health and lowering blood pressure. The blueberries fight against cancer, and premature aging. The ginger aids with digestion. This entry was posted in Breakfast and tagged Banana, Blueberry, FASEB Journal, Food, Ginger, Health, Oat, Oatmeal, Oatmeal Crisp, organic, pecans, PepsiCo, Whole Foods Market. Bookmark the permalink.